Please visit the first post of Tokyofoodcast Kaiseki Journal 1, Shoburo-no-kaiseki to find out about cha-kaiseki and story behind this series. Starting sometime around mid-June, all I want to eat is simple cold noodles and salad to battle the unbearable heat and humidity. During the summer, the whole country flees to kakigori, hiyashi chuka, and beer to momentarily escape the heat. I guess the tea world is no exception. The July kaiseki class was light and cold dishes perfect for the hot, humid days. 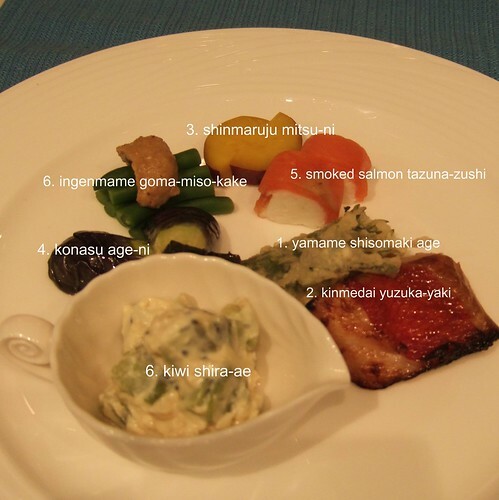 Just looking at the picture, it does not look much, but a lot went in to preparing each dish. Please read on! Kuchidori is little appetizer or called sakana using this character: 肴.
Filleted yamame trout is lightly floured, then wrapped with a shiso leaf and battered before deep frying. Alfonsino is marinated in yuan mix with equal amount of soy sauce, sake, mirin with a bit of yuzu flavor. Then, it is grilled with the skin side up first when using Japanse style top-side grill. Yuan yaki is a commonly used term to describe the marinade, a bit in the same way as teriyaki, and often used for fish. In this book, Japanese Cooking By Shizuo Tsuji, he describes the mix and how it is used with chicken. Sweet yam is first cooked with kuchinashi or gardenia seed for subtle orange-red coloring. After cooking, cool it with running water. Then cook again with water and sugar. I tried to find where the name, shinmaruju, came from, but no luck. Anyone have an idea? Tiny eggplant about a little bigger than my thumb is used here after cleaned and several lengthwise cuts are made for chasen-nasu. To prevent discoloring after cooking, treat eggplant with myoban or alum solution first. Deep fry the whole eggplant, then marinate in dashi broth based soup. A lot goes into this simple fried eggplant, but in the hot and humid summer, cold fried nasu with subtle dashi flavor is such a treat! Japanese yam, sticky and slimy yamaimo is used here instead of rice. Yam is peeled, then steamed. When it is soft enough, put it through a colander, to form paste like lump. It is not quite paste, but more like cooked a bit dry azuki paste. Add sugar and vinegar to the yam paste. On plastic shrink wrap, place the yam in log shape, then wrap it with smoked salmon pieces. I tried this at home and it’s quite time consuming but was easy enough. If you want to give your guests a bit of a surprise, it may be worth the trouble, but I like simple orthodox boring old rolled or pressed sushi with rice and fish better. Again, this is a very simple and common dish you see everywhere, but with a twist. Longbeans are cooked first, then after cooled, marinated in dashi broth base soup. Sesame, miso, and sesame paste are mixed with sugar and a bit of dashi broth. Longbeans are lined up perfectly with the rich sesame miso paste on top. Shira-ae is a term used very often to describe tofu paste creamy textured dressing, commonly used with greens such as spinach. Tofu is drained, made into paste, then dashi or sugar is added depending on what you are mixing with. It is common to see fruit base sweet shira-ae as part of meal. My mother used to mix persimmons with tofu paste and made kaki-no shira-ae all the time. That means, I can care less! I always wondered how somen shown in pictures or at high end restaurants are perfectly laid out, unlike any other noodle dish. Now I know the trick! This simple dish also takes a lot of prep. 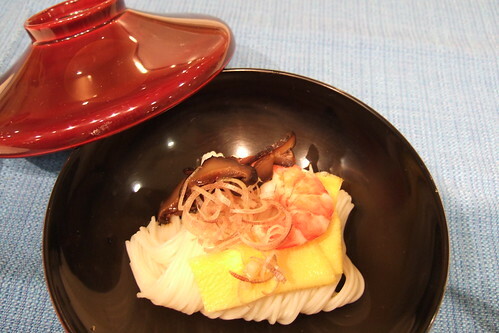 Each item was cooked separately such as perfectly thin layer of tamagoyaki, shiitake mushrooms, and shrimp. Right before serving, cook somen noodles, then cool it immediately with ice. Serve it in cool broth topped with prepared items.